I would like to be able to set some of these options via py3o. My immediate need would be to activate the option "Archive PDF/A-1 (ISO 19005-1)", to be able to produce a valid Factur-X invoice with the factur-x lib available from https://github.com/akretion/factur-x : this lib needs a valid PDF/A as input to produce a valid PDF/A-3 as output. Any advice to implement that ? Once this patch is applied, I run "java/py3oconvertor/compile.sh" and then I copy "py3o/renderers/juno/py3oconverter.jar" to the right place. 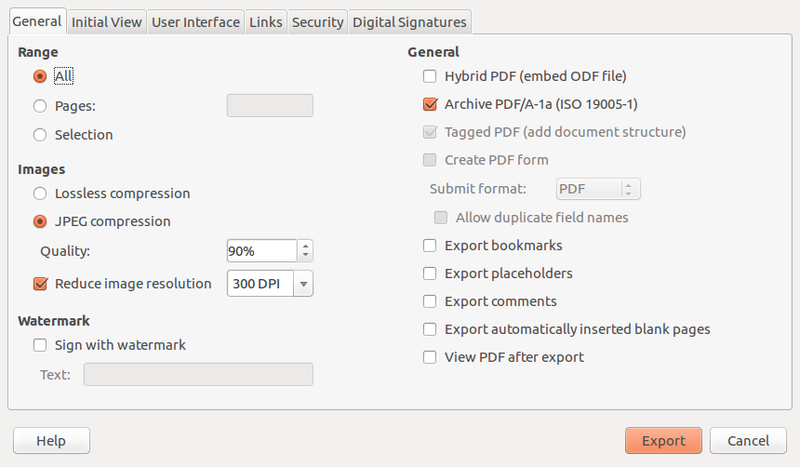 Next step: think how we could make these PDF filter options dynamic parameters. I am really interested in this. I'll try to find some time to help when I get out of the current rush state I'm in. I wanted you to know I really support and appreciate the effort you're putting into this! Thank you for your message. It encourage me to continue to work on this. The next step will be to design how we plan to transmit the PDF filter option through all the chain : Odoo -> py3o.fusion -> py3o.renderserver -> py3o.renderers.juno. I'll start to look into this, and I'll appreciate your feedback when your rush period will be over. I haven't seen a way to pass additional data through py3o.fusion -> py3o.renderclient -> py3o.renderserver without modifing their code. The modification may not be very complex, but the difficulty is that we would need to make 5 PRs across 5 different projects ! But I'm having difficulties setting up the FilterData in convert_document. My problem is that I'm "blind" in the Java code. I added some "System.out.println()" in the code, but I don't see the output of it. I think that if someone tells me how I can make "System.out.println()" work in the Java code of py3o.renderers.juno, then I should be able to make it work and I'll make the 5 pull requests. Still fighting with the Java code... I haven't found any information about the possibility to have Java logs in the output of py3o.renderserver... it may not be possible. But it seems that the java file py3o.renderers.juno/java/py3oconvertor/py3oconverter/Launch.java is designed to start the Java code directly with JVM (without py3o.renderserver), and in this case I should be able to have the logs in the console. I'm stuck with this. Any help would be greatly appreciated. I continued the work on this tonight. I have now implemented all the PDF export options in Odoo and I'm pretty close to publishing the odoo module, but there is still some improvements/cleanup to be done. I hope to find time tonight to do the 3 missing PRs (fusion, renderclient and renderserver). The only thing that looks strange to me is having to JSON-serialize pdf_options when transmitting it from py3o.renderclient to py3o.renderserver; I'd have thought the existing protocol these 2 components are using would allow a dict to flow in as is. It seems we can avoid dict to json conversion in renderclient (I guess pyf.station.client is doing it for us when it gets a dict as argument), so I updated my PR on renderclient. But we still need to convert from str to json in renderserver, so I didn't change the code there. My previous comment was wrong... I guess I tested it too fast and forgot proper deployment of the new version of py3o.renderclient after change. So I reverted my commit on py3o.renderclient. If you think you can avoid dict to json conversion in py3o.renderclient, please provide a patch and I'll review it.